I have a fondness for connections that bridge seemingly disparate worlds. Examples? Well, early on in my programming career I read Michel Foucault’s The Birth of the Clinic: An Archaeology of Medical Perception in a bid to figure out how developer-written documentation might work better. I was also intrigued by the inventor of the Pomodoro technique®, a personal productivity system, claiming inspiration from Hans-Georg Gadamer’s Truth and Method. I’ve even, on occasion, tried to get “personal development” types interested in stylistic similarities between language used in certain forms of hypnotherapy and the dramatic works of Samuel Beckett. In a similar vein, I’ve been intrigued by Hubert Dreyfus as a cross-world interloper. Dreyfus, an academic philosopher, had a surprise hit on iTunes with podcasts of his lectures (particularly popular with long-distance truck drivers, it seems). He has an odd double reputation in the world of computing. To some he is a hate figure on account of his critique, first made when he was at MIT in the 1960s, of rule-based Artificial Intelligence. This came from an insistence of the primacy of skilled behaviour over abstract cognition. His subsequent investigations into the phenomenon of skill acquisition subsequently gave him his other reputation: the “Dreyfus Model” is now used in parts of the industry for professional development. I’m sure there are people who don’t realize that it’s the same Dreyfus in both cases. Before I get down to discussing the book properly I feel I ought to say something about the term “human science”, since it might raise some hackles for looking like an illegitimate attempt to borrow the authority of science. It is a translation of the German “Geisteswissenschaft”, which itself was a translation of the English term “moral science”, which was used in Eighteenth and Nineteenth British philosophy to refer to the study of human nature. The point of mentioning this is that the concept largely predates the shift in meaning of the word “science” to refer primarily to the natural sciences. The modern dichotomy between science and the humanities isn’t historically well grounded. The book presents a dichotomy between what Madsbjerg and Rasmussen call “default thinking” and “sensemaking”. Now, I’m generally a bit suspicious of simple dichotomies—science vs humanities, reason vs emotion, left brain vs right brain, etc. So when reading The Moment of Clarity I was initially rather put off by the account of these two kinds of thinking. Default thinking is linear, reductive, logical. Which is to say: it’s thinking for squares. Whereas sensemaking is a hip way of thinking being sold to you by cool Danes. I’m being unfair, of course, but it doesn’t really matter. The account of this dichotomy (which could also be glossed as being a philosophical battle between René Descartes and Martin Heidegger) is a necessary part of the book; but isn’t its heart. That would be the account of what sensemaking is in its own right, and, even more so, the various stories that the authors tell. I suspect that the authors knew the introductory material in the book was a bit simplistic, but there is no way around that: this is a book aimed at businessmen, after all. So, what is sensemaking, then? Well, perhaps it would be better to start with talking about when sensemaking is for. The situation the authors describe is one of a company being in a fog: it no longer understands what it is about, and senses that it risks being about nothing other than making money. One of the examples given in the book is of Lego, famed for their brightly coloured plastic bricks, but who were in danger of becoming little more than a brand that could be placed on any item that might plausibly sell to their target demographic. When ReD Associates do market research as sensemaking, this is the kind of problem they are trying to solve. In the case of Lego, the question wasn’t one of finding potentially popular new products. They wanted to go to the heart of the phenomenon: What is play? What does play mean in the lives of children these days? Questions of this sort can be tackled through social science methods, and the answers give rise to a new understanding of what business the company is in, what it means, and what it should be doing. I think this points to an important difference in the relation between theory and evidence from the one that might be familiar from the natural sciences, in which it is the theory that is of ultimate importance and the data only matters as means to determine the correctness of a theory. The opposite view has theory as a way of bringing things into focus, so that particular details stand out as important: the laboriously collected evidence begins to speak for itself, in the moment of clarity that gives this book its name. I mentioned that the authors tell stories. These are anecdotes about various encounters the authors have had in the course of their work. Given their prioritizing of the richness of lived experience over dry statistics, it is perhaps an unsurprising aspect of the book, but no less enjoyable for it. I won’t say much more than that, as I doubt I’d be able to do their tales justice—the one about an ill-conceived brainstorming session endeavouring to solve the world’s health problems, told as part of the book’s skewering of the day-glo creativity of “outside-the-box” thinking, is a thing of beauty. That said, the ways knowledge can get embedded in narrative is an interesting topic in its own right; and in the light of what I just said about the role of theory it is perhaps significant that the ability to turn the stuff of people’s lives into compelling stories depends on having an eye for telling detail. There is a broader story to be told about corporate anthropology, and the particular role of hi-tech companies on the west coast of America. 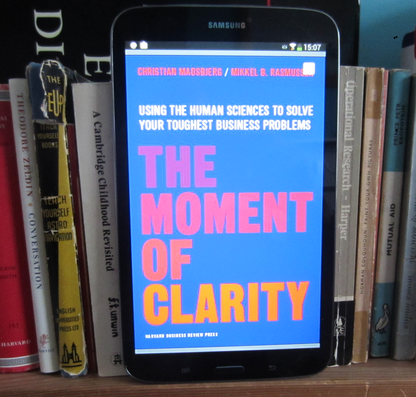 “The Moment of Clarity” tells part of it, taking chip-makers Intel as one of its case studies. One could draw a conceptual distinction between a company using anthropological research in order to understand its customers, which is the main focus of this book, and a company trying to understand itself. In the latter box you would put, for example, work instigated by John Seely Brown at Xerox on organizational learning. In reality the distinction isn’t clear cut: the book shows an intimate connection between how an organization sees itself and how it sees its environment, and Intel provides an excellent example of this. Intel was hiring people such as Genevieve Bell out of a sense, in the late 1990s, that as computers spread from labs and offices to the home, and as the market went global, Intel no longer understood who it was selling to. However, what Bell and her colleagues did was to analyze Intel’s corporate culture: its sense of its own history, along with its everyday rituals and routines. “They became well versed in the levers of power at Intel: the decision makers, the influencers, the meetings that really mattered, and the rules that could and could not be broken.“ Armed with a realistic, rather than utopian, understanding of the company’s internal politics they were then in a position to engineer a culture change. “Culture change”: there’s a phrase to conjure with. Someone once said to me that saying you need a culture change is like saying you need a perpetual motion machine: if that’s what you say you want, there will always be someone willing to sell you it. That may be a bit harsh, but then as Venkat Rao has pointed out, consultancy is such a notorious market for lemons that people are generally wise to it. At the cheap end of this particular market you don’t get detailed observations of on-the-ground realities, as that would take too long and be far too much like hard work. Instead you get personality tests, team-building exercises, and ruminations on the inner truth and greatness of the latest mission/vision/value statement. Maybe if you’re lucky it will be off site, and you’ll get a buffet lunch too. In software companies, engineers will often treat this sort of nonsense as being a message from the clue fairy: the shark has been jumped and it’s time to move on. I’ve heard that academic anthropologists are becoming increasingly wary about doing fieldwork in corporations. It’s not difficult to understand why that might be. All organizations contain tensions and conflicts, some more so than others, with the most obvious being between “bosses” and “workers”. This means that understandings of how an organization works can be highly politicized, and anyone might think twice before walking into the middle of that kind of situation. Of course, ethnographers studying some remote tribe will also have to learn how to negotiate its politics; but at least they wouldn’t have one faction being both the target audience for the research and the controller of the purse strings. Being a professional pessimist, I feel compelled to write a downer ending to my review. One way I could do this, given that I’ve just touched very lightly on politics, and knowing the importance of Martin Heidegger to ReD Associates’ project, would be to say something about Heidegger’s own politics: whatever he may have got right, his engagement with the NSDAP showed him up as being both a ruthless opportunist and a dewy-eyed true believer. However, I’d prefer not to go there, but I think I’ll be able to strike a similar note by considering the life of Steve Jobs. The Moment of Clarity praises Jobs for standing at the intersection of technology and the humanities, so opening up a new world in which Apple flourished so successfully that, as the authors put it, “it can feel a little too obvious to mention Steve Jobs as a great business leader.” It is possible to question, though, what this success actually amounted to. Steve Jobs’ star has fallen a long way in tech circles. Some people never bought into the idea that selling shiny toys to rich westerners made him some sort of saint, but now that he is dead his famed “reality distortion field” is wearing off more generally: his shabby treatment of those around him is a matter of public record, and his approach to industrial relations is the subject of a class action lawsuit. Jobs once said that he would spend his dying breath destroying Android: a petty ambition, and one at which he failed. Why mention this? Just to make the point that even if you’re able to get people right, you can still get things very wrong. Some people use Zossima-like sensitivity to help their fellow human beings, whilst others merely refine the effectiveness of their cruelty. (Who was it who said: “I use psychology like stupid people used guns”?) My hunch is this: getting people right won’t in itself make you a better person, but it will certainly raise the stakes.